At one point in American history, dogs and blacks were not allowed in public places. During the British occupation of China, it was 'dogs and Chinese' while at the first Mumbai marathon the rule was against dogs and wheelchairs. A dog has thus become a metaphor for seclusion, for denying someone their fundamental rights. 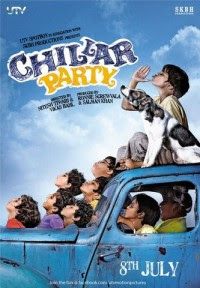 "Chillar Party" uses this metaphor in a brilliant, but hilariously entertainment manner to make a statement against those who seclude, be it Shiv Sena in Mumbai, fanatic Hindus who want Muslims out of India, or upper class Hindus who refuse lower caste people basic rights etc. That it does so while making you laugh, is its greatest strength. After a street kid Phatka (Irrfan Khan) and his stray dog Bhidu begin cleaning cars in a rich locality, the rich, school going kids first try to fend him off, but later become great buddies. When a minister offended by the dog passes a law to ban all street dogs from Mumbai, the kids resort to some unconventional activism to save their beloved dog. But is it even possible for the powerless kids to take on a high and mighty minister? "Chillar Party", in essence, is a children's film. But those who can read between the lines and see between pictures know that the most brilliant, imaginative and metaphorical literature and cinema in the world, are for kids. Thus in literature you have your 'The Prince' and 'Gulliver's Travels', while the films of Iranian auteurs, though simple and innocent, attack an unjust system. "Chillar Party" is a welcome addition to these greats of world cinema. Yet, what does a children's film need to be good? A simple story, good metaphor, oodles of cuteness and innocence, fun and humour and a band of actors to carry it all off. If you have these, any other drawbacks can be excused. "Chillar Party" has these and much more. The film is filled with observations and idiosyncrasies that will leave you laughing your guts out. Every child in the film has acted with such restrained understatement that they give your popular stars a run for their money. And yet, beyond all these beautifully working elements, it is the metaphor of the dog that takes the cake. Unlike nature, the world of humans is full of seclusion. Thus a Bal Thackeray in the 1960s wants the South Indians, in the 1990s the Muslims, and now the North Indians out of Mumbai. Fanatic Hindus want Muslims out of India. The Americans wanted blacks out of America. The Australians want Indians out. The Sri Lankans want the Tamils out. The list is literally endless. But as the film so valiantly, sincerely and emotionally argues, what is needed is inclusion. "Chillar Party is filled with allegorical moments that hint at how the poor, the disenfranchised, the adivasi, the handicapped, the minority survive. When the rich kids take away his cleaning cloth, Phatka has no qualms about washing cars with his only tshirt. The rich consider poor to be pests and want them out, but the poor strive and ironically serve the same rich. Some, pushed to the edge, take up arms against mighty odds, like in the tribal belts of India. Besides saluting the creative genius of writer-director Vikas Bahl and Nitesh Tiwari, one has to bow to UTV and Salman Khan, for flexing their muscles for something so beautiful. "Chiller Party" may be a small film. But as cinema goes, in its adroitness, it is much more mature than 99 percent of the films ever made in India. And that, you'll reckon, is no 'small' achievement.